The Brass Saxophone clearly visible in the chamber viewing window. 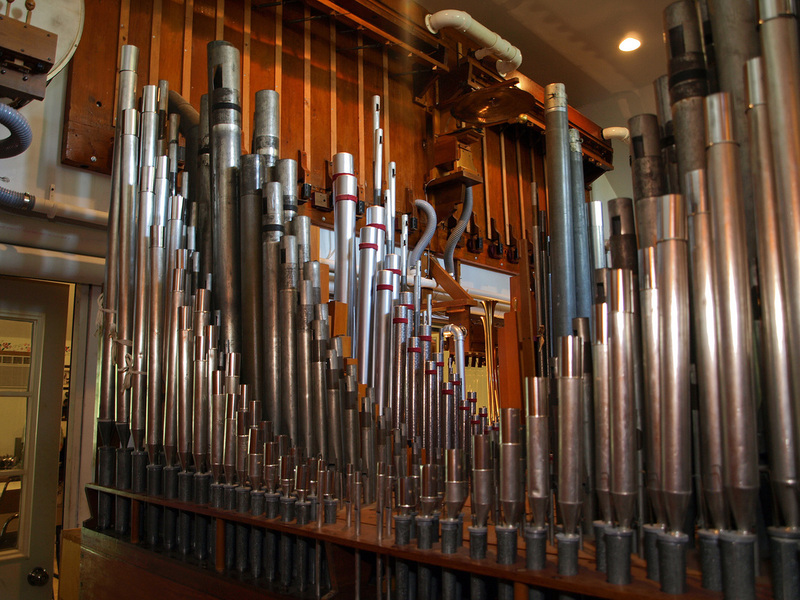 Gary Bieck’s long-time dream of acquiring a residence pipe organ came to fruition in the spring of 1996, with his purchase of a 2/5 Wangerin organ. Originally a cheese factory, the music room attached to the home had also functioned as a commercial flower shop for a time. The Wangerin organ was installed unenclosed in the music room, and made a lovely sound, but Gary became fascinated with the theatre organ when he heard one installed in another DTOS member’s home. Gary then decided to build a pipe chamber to accommodate a larger organ! The resulting space is 16 by 24 feet, with a 14-foot ceiling. 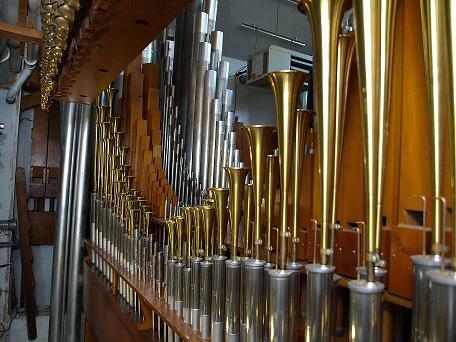 In the meantime, the Wangerin organ was sold to another private individual. 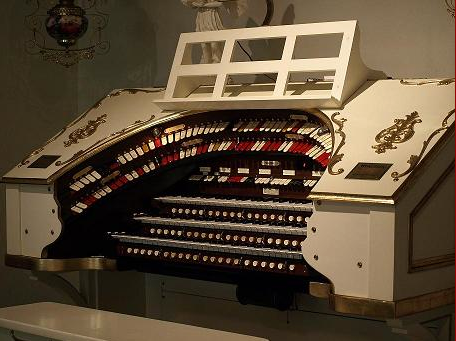 The three-manual, 19-rank Wurlitzer now playing at the Bieck Residence began its life as Wurlitzer Opus 1700, a 2-manual, 6-rank “Style D”, originally installed in the Grand Theatre in Malone, New York. In 1929, it was removed and reinstalled in Cortland, New York and was again moved and reinstalled in Geneva, New York in 1932. It was ultimately purchased by Charles Schubert for a home installation that never materialized. Gary purchased the instrument, minus its console in 2000. He restored and installed it in the chamber, and in a very short time, additional Wurlitzer wind chests and pipework began to appear. A ten horsepower blower, the gorgeous three-manual Wurlitzer console, and other parts were purchased when the very organ that had inspired Gary's passion for theatre organ was sold. With the organ speaking into the former flower shop, it soon became apparent that a larger music room was needed. In May of 2000, the music room was enlarged and now measures 22x43 feet. This both increased the acoustics of the room, and allowed more seating for the growing number of concert attendees. The annual DTOS "Ice Cream Social" has become one of the premier events on our calendar. Regularly featuring top-rated artists, and Gary's prize winning gardens, it is a feast for the eyes, and the ears! Another view inside the chamber, with the Clarinet in the foreground.